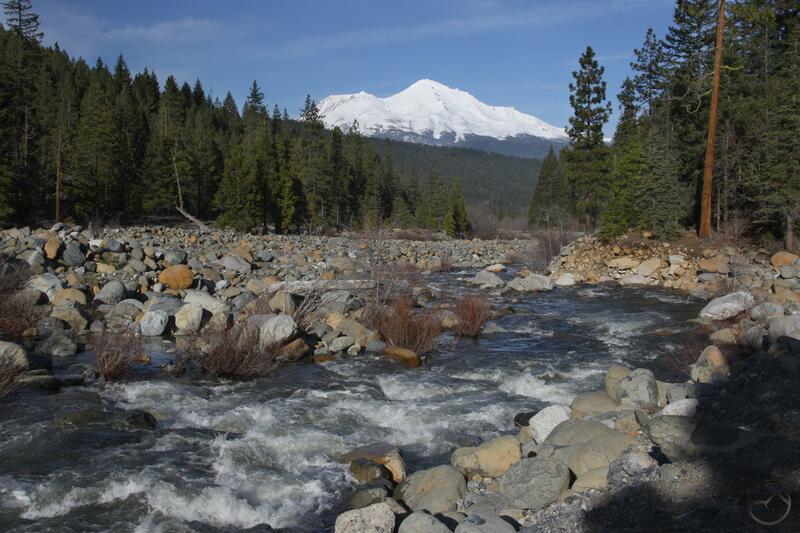 The Mount Shasta region is justly famous for its grand mountains. Though somewhat overshadowed by the rugged nature of the terrain, the area is also known for its excellent rivers. Wild and beautiful, these rivers flow through deep canyons and wide valleys, complementing the deep power of the mountains with beauty, grace, energy and a power all their own. The Sacramento, California’s largest and longest river begins in the mountains just west of Mount Shasta and makes the first steps of its long journey within sight of the great volcano. The McCloud River begins its journey east of Mount Shasta but flows near the foot of the mountain, its beautiful waterfalls complementing the mountain perfectly. The Shasta River flows north through the Shasta Valley. Almost its entire journey is within sight of the mountain. 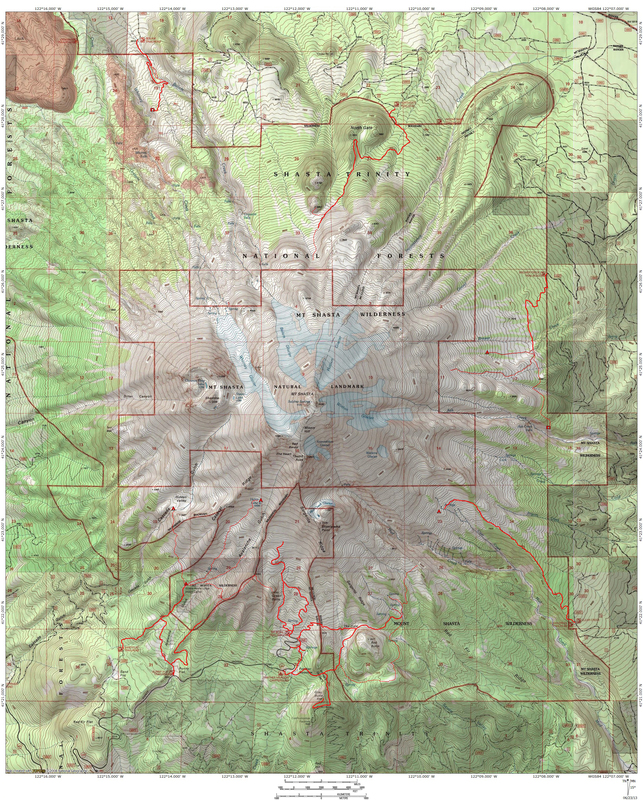 The Trinity and Klamath Rivers are a little further away and neither flow right around Mount Shasta but both fall within the peak’s orbit and add a great deal of beauty and recreation to the region. Click to enlarge the galleries. Basalt chute above Upper Falls. Between Algoma and Skunk Hollow. Wow, what beautiful countryside. Great pictures to show it off. Thanks much! I spent four years going to school in Texas and your neck of the woods holds a special place in my heart too (as do the Wichita Mountains, up in Oklahoma)! If this is Bubba Seuss from Newman, shoot me an email…Im hoping you can make it to our reunion! I used to tape your ankles 🙂 would love to see you!!! Hey Gen! Thanks for shooting me a message. It sure has been a while. Hard to believe that we graduated 20 years ago! I would love to come to the reunion. Unfortunately, under a harsh deadline for my latest book and I will be spending most of the next couple of months up in the Sierra GPSing and photographing trails. That will leave me only October to finish 120,000 words. Yikes! I really do appreciate the lookup though and I would certainly like to catch up with everyone, however possible (I am not on Facebook, for what that’s worth). Is there any way I can still be on the email list for updates and all that (not sure who is organizing things)? I hope you are doing well. Last time I talked to you, I think you and Emily Crandall had just moved out to North Carolina. Are you still out there? Married? If you’re ever heading up I-5 and want to stay in the mountains for a while, my wife (Harmony) and I have a large guest cabin and we love having people stay and play on the mountain. Of course, my kids love playing with whoever is there too! Again, thanks for tracking me down. I would love to stay in touch! Can you recommend a 2-day, 1 night overnight trip for hiking/fishing/camping with a dog April 14-15? 5-6 miles per day or less on rather simple terrain would be perfect. I have a 5-mo old puppy who is too young for difficult hikes, but ready to be introduced to great outdoors. thanks in advance for any pointers.